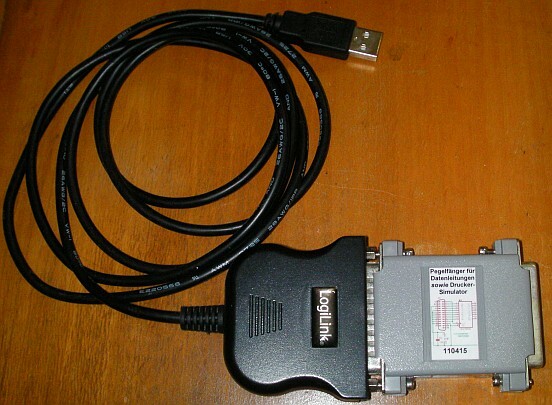 You have such a useless USB ParallelPrinter Adapter and need a true parallel port? No kernel hacks. No driver. Simple user-mode privilege. Compatible from Windows 98 upto Windows 10 64 bit. Perfect for serial microcontroller programming equipment, solves the chicken-or-egg problem. Such converters implement the USB printer class on the USB end, and a suitable parallel port for old-style printers on the other end. Simple, but nothing more. As a negative side effect, such adapters keep their data port in high-impedance state while non-communication. Therefore, a latch is needed for capturing the last output data byte. Such adapters often said to have a “bidirectional” interface. This is only true for the IEEE1284 Negotiation in Nibble Mode, not for the 8-bit data port. However, forget using the IEEE1284 Negotiation for your data input! It will definitely introduce more trouble than you ever expect. If you really need a higher data input rate, forget using your USB→ParallelPrinter adapter for that purpose. no extra hardware is necessary. Changing software by using my inpout32.dll is the only task. Pin numbers are for D-Sub 25, not for the 36-pin Centronics printer connector! For the 8 Data bits you need a latch oder flipflop circuit! Valid data only appears some microseconds around STROBE pulse. (Edge-triggered) flipflops advance over latches that clock polarity is out of concern. In case of older bi-polar ICs (74LS), the IC must be powered externally. But even for CMOS, you should consider external powering when available. The schematic above draws power from INIT pin. Hint: In no case, CCD picture data should be transferred via such a “solution”! It would be incredile slow! In such a case, a microcontroller, customized firmware, and customized DLL is necessary. This board is an excellent starting point with a good price. Some applications need other output or input lines, so, once building an adapter with the flipflop IC, one can swap the lines between the two sides. But that requires some more virtualization inside inpout32.dll, which is currently not implemented. More complex circuitry at the output of your USB ParallelPrinter converter may enable more output (12) and input (5) lines but needs a very specialized build of inpout32.dll for parallel-port virtualization. Ask me if you need support in this case! Parallelizing of S3 to S3..S5 boosts speed by factor 3. Therefore 3 kBit/s. The absolute limit for such an adapter. The added CMOS flipflops parallelize one serial input onto three parallel lines. This will boost bit-serial devices by factor 3. Sounds not much, but it's still worth to implement for some cases. The circuitry fits into a dongle-style shell. Keep the parallel port wires as short as possible! In case of more distance needed, prefer extending the USB wire.